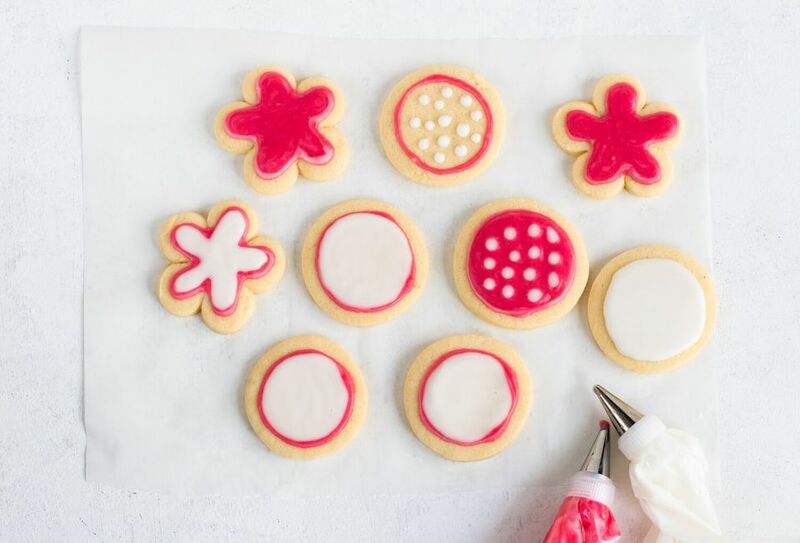 This sugar cookie icing recipe is ideal for decorating sugar cookies, because you can easily manipulate the consistency to make this sugar cookie icing thicker or thinner. And like royal icing, this homemade sugar cookie icing dries quickly, which means you can add more decorations (colored sugar, sprinkles, etc.) without having to wait hours for this sugar cookie icing to dry. Combine the powdered sugar, milk, and corn syrup in a bowl. Whisk all ingredients until smooth. You want the icing to be thin enough to outline the cookies and spread easily, but thick enough so that the icing won't run off the sugar cookies. Think: thicker than Elmer's glue and thinner than paste. It takes some practice to achieve the ideal consistency. If you need to make the sugar cookie icing thinner, add milk, 1/2 teaspoon at a time, until the desired icing consistency is reached. If you need to make the sugar cookie icing thicker, add powdered sugar, 1 teaspoon at a time, until the desired icing consistency is reached. If you're decorating a lot of sugar cookies, you may want to make a large batch of this homemade sugar cookie icing, and divide it into three or four bowls, stirring in a few drops of food coloring to each bowl, until the desired icing colors are achieved. While you could easily use a flattened spatula or butter knife to smear on the icing, you could also use a piping bag. If you don't have one, you could easily make one by putting the icing into a Ziploc bag and then cutting a little bit of the corner off to make a tiny hole. For even easier decorating, you can use squeeze bottles, which you could find at a craft store. Royal icing is usually used for finer details, but this icing works just as well to add a sweet and colorful layer on top. The best cookies for icing are sugar and gingerbread cookies because they are hard and have a flat surface to decorate. Make sure that the cookies are completely cool, otherwise the heat will make the icing melt. Then let your decorated cookies rest for 24 hours to be completely set. If you're decorating a shape, try piping the border first and letting it dry a bit. Then when you fill it in, the icing won't run off the cookie and if you're using multiple colors, then they won't run into each other. Before it sets, feel free to add sprinkles or colored sugar for extra decor!